SEATTLE & AUSTIN, Texas--(BUSINESS WIRE)--(NASDAQ: AMZN) – Amazon.com, Inc., Chase, and Whole Foods Market today announced that Amazon Rewards Visa Cardmembers can now enjoy even more rewards when shopping at Whole Foods Market on everything from animal welfare-rated meat to sustainably caught wild and responsibly farmed seafood to a vast selection of local, Whole Trade® and organic produce. Starting today, eligible Prime members will earn 5% Back on Whole Foods Market purchases when using the Amazon Prime Rewards Visa Card, in addition to the rewards they already receive everywhere else they shop, including 5% Back on all Amazon.com purchases, 2% Back at restaurants, gas stations and drugstores, and 1% Back on all other purchases. 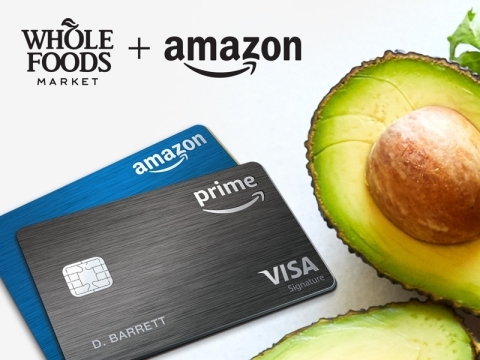 Cardmembers who are not eligible Prime members will now earn 3% Back on Whole Foods Market purchases when using the Amazon Rewards Visa Card, in addition to the rewards they already receive everywhere else they shop, including 3% Back on all Amazon.com purchases, 2% Back at restaurants, gas stations and drugstores, and 1% Back on all other purchases. “We are excited to launch the Amazon Rewards Visa Card in our stores, offering benefits to our customers on all of their purchases at Whole Foods Market,” said John Mackey, Whole Foods Market co-founder and CEO. “We’ve seen incredible excitement and adoption around our Amazon Rewards Visa Credit Cards and are thrilled to partner with Amazon and Whole Foods Market to bring even more rewards to our joint cardmembers,” said Leslie Gillin, President, Chase Co-Brand Cards. From lowering prices on popular items and delivering everyday staples and locally sourced items through Prime Now to rewarding customers for shopping Whole Foods Market’s quality products, the Amazon Rewards Credit Cards are another way both companies are working together to improve the lives of customers. Whole Foods Market and Amazon will together continue innovating to provide customers with a great shopping experience, in-store offerings, and lower prices. To learn more about the Amazon Rewards Visa Cards, visit: amazon.com/amazonvisa. Prime was designed to make your life better every single day. Tens of millions of members around the world enjoy the many benefits of Prime. In the U.S. that includes unlimited access to award-winning movies and TV episodes with Prime Video; unlimited access to Prime Music, Audible Channels for Prime, Prime Reading, Prime Photos, Twitch Prime; early access to select Lightning Deals, one free pre-released book a month with Amazon First Reads, and more. Prime was built on the foundation of unlimited fast, free shipping and members receive unlimited Free Two-Day Shipping on more than 100 million items, Prime FREE One-Day Shipping and Prime FREE Same-Day Delivery in more than 8,000 cities and towns, and two-hour delivery with Prime Now in more than 30 major cities. Start a free trial of Amazon Prime at amazon.com/prime. Chase is the U.S. consumer and commercial banking business of JPMorgan Chase & Co. (NYSE: JPM), a leading global financial services firm with assets of $2.5 trillion and operations worldwide. Chase serves nearly half of America’s households with a broad range of financial services, including personal banking, credit cards, mortgages, auto financing, investment advice, small business loans and payment processing. Customers can choose how and where they want to bank: 5,100 branches, 16,000 ATMs, mobile, online and by phone. For more information, go to www.chase.com.